Meet friends Nancy and Leigh this week! We, along with our husbands and children, have been friends for over twenty years. Even though we live four hours away from each other, we visit several times a year, and talk/text frequently. We are scrapbookers turned card makers. We have been scrap booking for over ten years and card making for about two years. Up until recently, the only stamping we did was sentiments on our cards, but we each bought Copic markers at the Great American Scrapbook Convention last month and will be doing more stamping of images to color. We each have dedicated scrapbook space in our homes. Nancy has a great upstairs loft that is wonderfully outfitted for crafting and I have taken over our formal dining room with a craft desk, extra table and shelves.It's never referred to as the dining room anymore; it's the scrap room. 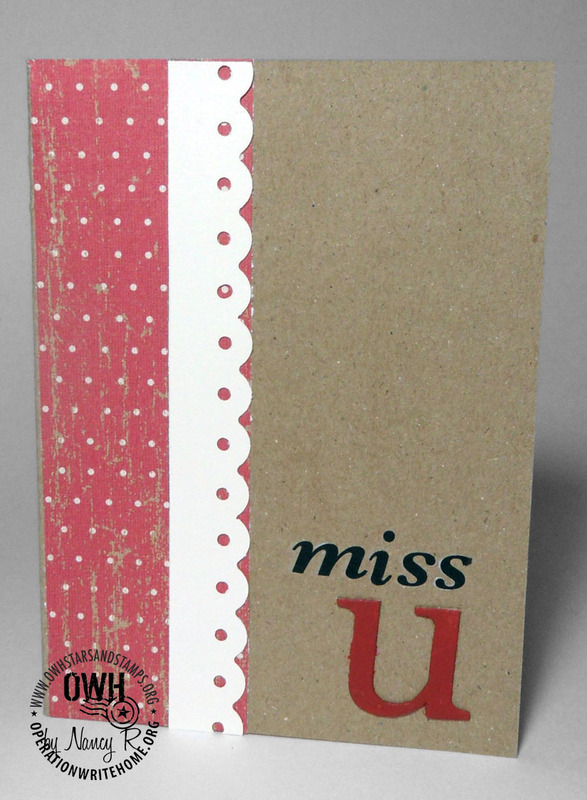 Nancy's favorite products are rub on sentiments and letters, ribbon and buttons. Leigh's favorite product has to be paper. Is copying card designs we see on blogs and magazines considered a technique? If so, we are champs at it. Neither of us feels very creative, but do get much inspiration from the creativity of others. Nancy says she doesn't have a favorite technique, but she's more willing than Leigh to try new things. 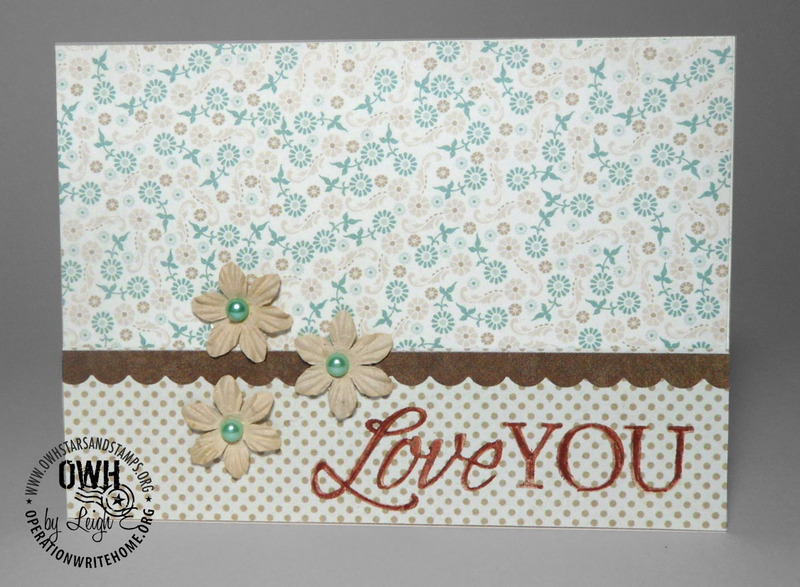 Leigh likes the look of torn paper, and embossing with the Cuttlebug. 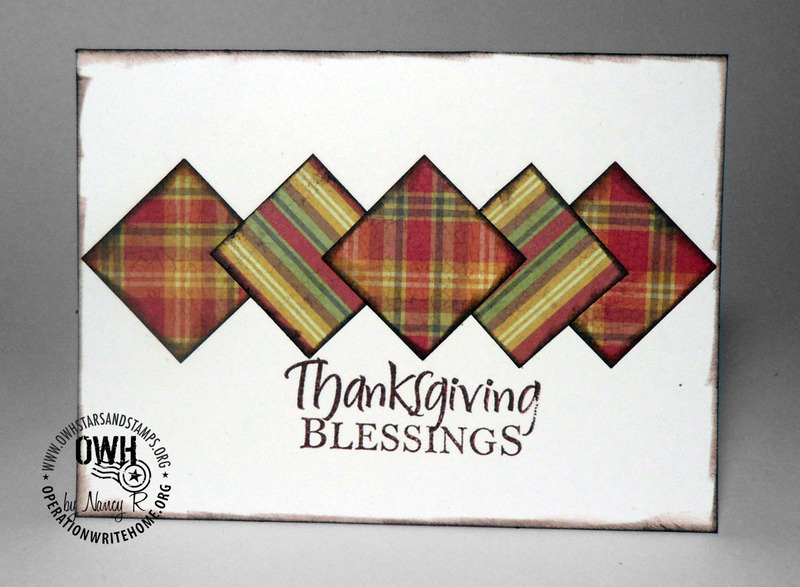 Nancy tends toward pink, green and jewel tones in her work, and Leigh likes fall colors, as well as colors that match the feel of the sentiment on a card, like bright primary colors for a kids birthday card. Leigh heard about OWH when it was still Cards for Heroes via Jennifer McGuire's blog. She told Nancy about it and the next time we were together we made cards and haven't stopped since. We promise, kids, that we'll eventually finish your scrapbooks! We knew we were hooked on card making when we found ourselves perusing scrapbook paper and saying "Oh, these would make a good cards." 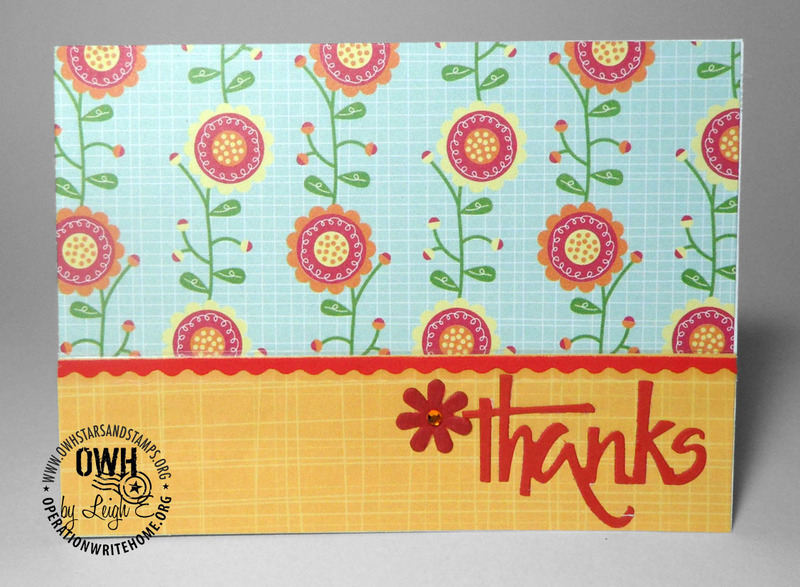 We both love knowing that the cards we make for OWH will be appreciated by both the heroes and their loved ones. We also get great satisfaction of making the lives of our service men and women a little easier. And should a husband maybe say something about us buying yet more supplies and tools we love being able to say "it's for the troops!" Absolutely beautiful cards. Thanks for the inspiration and for sharing your great cards. Your cards are beautiful - thank you for sharing them! Beautiful cards! How great to hear about best friends being able to share such a fun hobby and for such a good cause. I love that wild celebrate card! You can do so much with a little piece of paper. I love how you focus is on the paper! So many times I find I'm covering up what could be the best part of a card. Thanks for the inspiration! Your cards are so pretty and it was fun "getting to know you"! Great cards! I love the colors and simple designs, so effective. Isn't it great to share a fun and meaningful hobby with a good friend? Welcome! These card are all so beautiful!!!! Obviously, both of these women are very talented!!! Awesome cards and even more awesome friendship. Love that! Hey, Ft. Worth girls congrats on getting featured from a Keller girl, a double punch of talent. I love all of your cards and the wonderful variety of color and styles you have created. 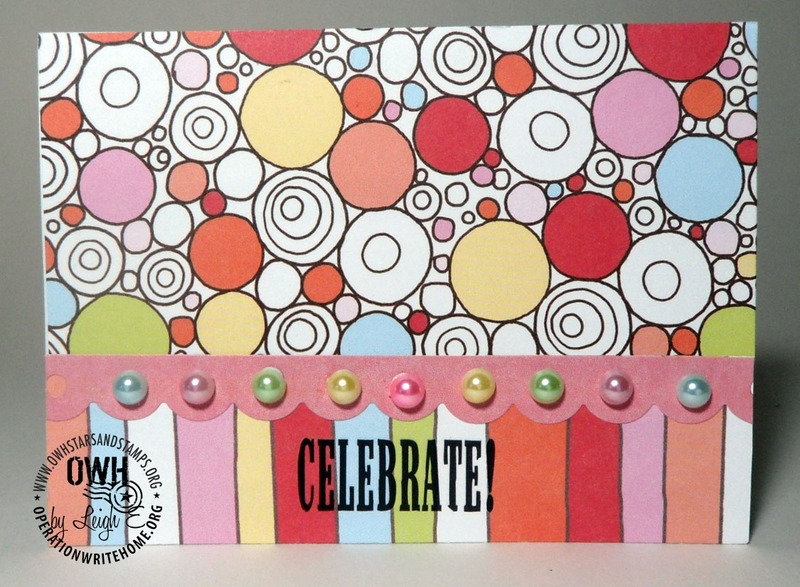 I also am a fan of Jennifer McGuire and think she is a fantastic stamper! !